CAA invites nominations and self-nominations for three individuals to serve on the Art Journal Editorial Board for a four-year term: July 1, 2016–June 30, 2020. Candidates may be artists, art historians, art critics, art educators, curators, or other art professionals; institutional affiliation is not required. 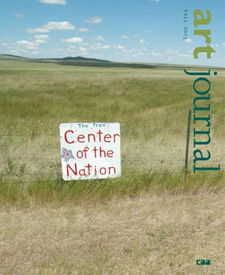 Art Journal, published quarterly by CAA, is devoted to twentieth- and twenty-first-century art and visual culture. The editorial board advises the Art Journal editor-in-chief and assists her or him in seeking authors, articles, artists’ projects, and other content for the journal; performs peer review and recommends peer reviewers; guides its editorial program and may propose new initiatives for it; and may support fundraising efforts on the journal’s behalf. Members also assist the editor-in-chief to keep abreast of trends and issues in the field by attending and reporting on sessions at the CAA Annual Conference and other academic conferences, symposia, and events. The Art Journal Editorial Board meets three times a year, with meetings in the spring and fall plus one at the CAA Annual Conference in February. The spring and fall meetings are currently held by teleconference, but at a later date CAA may reimburse members for travel and lodging expenses for the two New York meetings in accordance with its travel policy. Members pay travel and lodging expenses to attend the conference in February. Members of all editorial boards volunteer their services to CAA without compensation. Candidates must be current CAA members and should not be serving on the editorial board of a competitive journal or on another CAA editorial board or committee. Members may not publish their own work in the journal during the term of service. Nominators should ascertain their nominee’s willingness to serve before submitting a name; self-nominations are also welcome. Please send a letter describing your interest in and qualifications for appointment, a CV, and your contact information to: Chair, Art Journal Editorial Board, College Art Association, 50 Broadway, 21st Floor, New York, NY 10004; or email the documents to Joe Hannan, CAA editorial director. Deadline: April 15, 2016.